Of all American values, entrepreneurship is one of the most revered. Many Americans dream of the day they can take out a loan, build their own business and make it on their own. Big metro areas like San Francisco and New York get most of the attention when it comes to entrepreneurship but there are plenty of smaller metros where people are also living the American dream. We were curious about them. Read on for SmartAsset’s look at which small and mid-size metro areas in America are the most entrepreneurial. In order to determine the most entrepreneurial small and mid-size places in America, we considered factors like the percentages of new and small businesses in a metro area, the percentage of workers who work for new businesses, the number of small business loans per 10,000 residents and the area’s unemployment rate. For the purpose of this study, we defined small to mid-size metro areas as those with less than 1 million residents. In examining how entrepreneurial a metro area was we gathered data on certain business indicators. The percentage of businesses which are new measures how many people in each area are starting businesses and can be considered entrepreneurs. The percentage of small businesses is a way of measuring business ownership rates across the area. 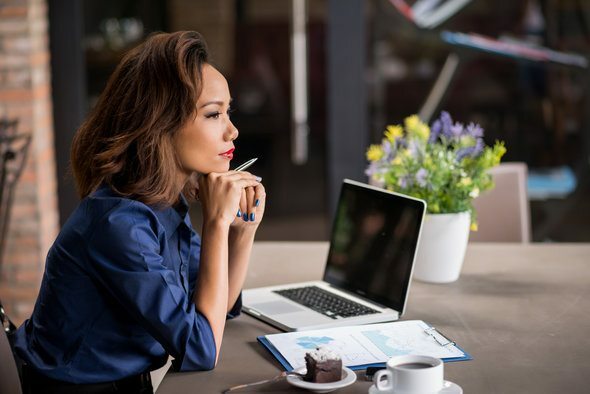 As the small business rate rises in an area it means that the number of business owners also rises, thus a higher proportion of the area’s population are business owners. The small business loan rate shows how much interest there is in a population for launching new businesses i.e. becoming entrepreneurs. And the percentage of employees working for new businesses is a measure of how successful the entrepreneurs in an area are. To get a better understanding of how we put all these numbers together to create the final ranking, read the data and methodology section below. America, land of small businesses – Our data shows that the vast majority of businesses in America are small. We defined a small business as one with less than 10 employees, and our data shows that on average 70% of businesses in any metro area fit that description. The Great Plains come out on top – Six of the top 10 places in our ranking lie in the Great Plains. The region tends to have a large concentration of small businesses. Struggling Indiana – Indiana didn’t fare as well. Three of the bottom 10 metro areas are located in Indiana. 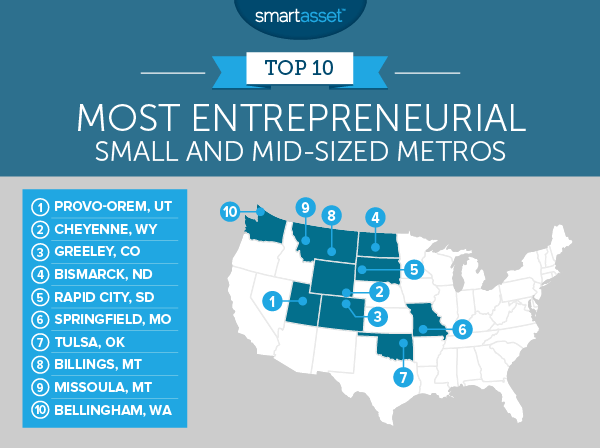 Provo-Orem claimed the top spot in our ranking of the most entrepreneurial small and mid-size places. More than 18% of businesses in Provo-Orem were launched between 2012 and 2014 and 6.79% of employees work for a new business. It ranks first for both of those metrics. Plus, a whopping 76.2% of businesses in the area are classified as a small business (meaning there are less than 10 persons employed by the business). Cheyenne, a metro area that’s home to 97,121 people and encompasses the capital of Wyoming, comes in a close second in our study. Our data shows that Cheyenne is a hub of small businesses. About 76% of businesses in Cheyenne have less than 10 workers, which is the sixth-highest rate in the study. And the area’s 5.1% unemployment rate is lower than that in our first place city, Provo-Orem. Greeley, Colorado is a burgeoning area for entrepreneurs and small businesses. Our data shows that 16% of the businesses in Greeley have been started between 2012 and 2014, the third-highest score for that metric in our study. It also has a healthy community of small businesses. More than 74% of businesses in Greeley are small businesses. Business in Bismarck, North Dakota is booming. It has the lowest unemployment rate in our study (3.3%). And about 71% of the businesses in Bismarck can be considered small. Bismarck citizenry also seem eager to start new small businesses. Over the past year, Bismarck residents had a small business loan rate of six per 10,000 residents, that’s the second-highest in our top 10. Rapid City, South Dakota which has a population of 145,457, snags the fifth spot in our study. Although only 12% of businesses in Rapid City were started between 2012 and 2014, they are responsible for employing 5.7% of all workers in the area. This suggests that while there are not a ton of new businesses in Rapid City, the ones there are doing well. Plus, almost 75% of all businesses in Rapid City are categorized as small. The area also has one of the lowest unemployment rates in our study (4.9%). Moving to the Mount Rushmore State? Check out our South Dakota income tax calculator. Springfield, Missouri is the most entrepreneurial of all the Springfields in our study, beating out Springfield, Illinois as well as Springfield, Massachusetts. There are a little less than five small business loans per 10,000 residents in Springfield, Missouri. It also ranks well for percentage of new businesses and percentage of small businesses – 15.9% and 73%, respectively. Tulsa is the lone representative of the Sooner state in our top 10. With a population of 980,794, Tulsa is also the biggest metro area in our top 10. Unlike some areas which have some very good scores and some low scores, Tulsa cracks the top 10 due to consistency. It has solid scores across all factors, without any one metric standing out in particular. Tulsa’s best scores were in percentage of new businesses and percentage of all employees who work in new businesses, for which it ranked 19th and 25th respectively. Two metro areas in Montana appear in our top 10. The first is Billings, which has a population of 169,329. Billings ranks fourth overall for its 4.5% unemployment rate. It also ranks third in our study for its rate of small business loans. Over the past year, there were more than seven small business loans per 10,000 residents – that’s the highest in our top 10. 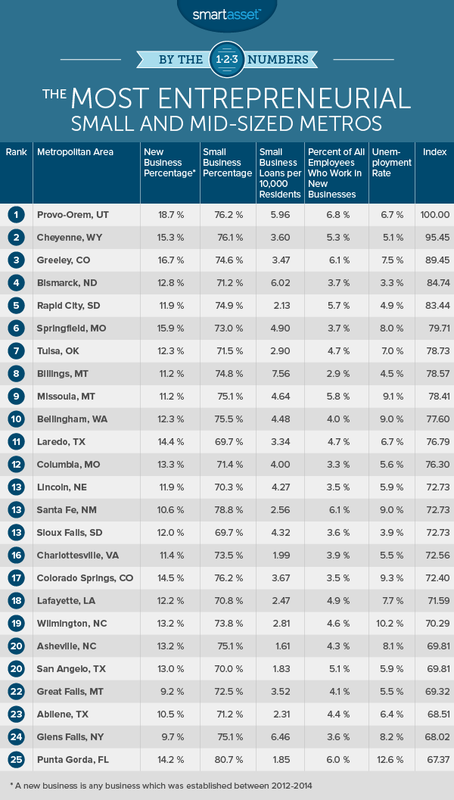 Billings isn’t ranked higher in our study because it has a relatively low percentage of new businesses (11.2%). Missoula is the second metro area in our top 10 located in the Treasure State. Missoula is one of the smaller areas in our study with a population of 114,181 but it still manages to pack a punch. Missoula has the 10th-highest rate of small businesses and the 19th-highest rate of small business loans. About 75% of all businesses in Missoula have less than 10 employees and in the past year, there have been more than four small business loans per 10,000 residents. Bellingham rounds out our study of most entrepreneurial metros and is the only West Coast area to crack the top 10. Bellingham ranks in the top 30 for the rate of new businesses, the rate of small businesses and the number of small business loans per 10,000 residents. Looking at small business percentage specifically, Bellingham ranks seventh. More than 75% of all businesses in Bellingham have less than 10 employees. As previously mentioned, we considered small to mid-size metro areas as those with less than 1 million residents. We did not have complete data sets for some metro areas which fall under this classification. These areas are not included in our final ranking. Percentage of new businesses. This is the percentage of businesses in an area which were started between 2012 and 2014. Data comes from the U.S. Census Bureau’s Longitudinal Business Database 1977-2014. Percentage of small businesses. This is the percentage of businesses in an area which have less than 10 employees. Data comes from the U.S. Census Bureau’s 2014 Business Pattern Survey. Small business loans per 10,000 residents. This is the number of small business loans issued between October 2015 – October 2016 to residents of the area. Data comes from the U.S. Small Business Administration. Percentage of all employees who work in new businesses. This is the percent of all employees in an area who work in businesses which were launched between 2012 and 2014. Data comes from the U.S. Census Bureau’s Longitudinal Business Database 1977-2014. Unemployment rate. Data comes from the 2015 U.S. Census Bureau American Community Survey. We ranked each metro area across these five metrics. We then averaged those rankings giving equal weight to each metric. The final index was determined using those final averages. The metro area with the highest ranking received a score of 100 and the area with the lowest ranking received a score of 0.